DOWNLOAD THE PRINTABLE PDF HERE. Despite the constitutional prohibition against a national religion, court rulings and policies continue to favor one religion over others or none, for example by allowing federally-funded adoption agencies to discriminate against non-Protestants. By claiming crosses and other Christian iconography are “secular,” the courts erase Americans of other or no religions, as with the taxpayer-maintained Bladensburg Cross that supposedly represents all local WWI war dead yet excluded the names of Jewish soldiers. By twisting the notion of “religious freedom,” the government supports discrimination against lesbian, gay, bisexual, transgender, and queer people in the commercial, public, and military sectors. Laws requiring school standards for secular subjects like science and English are not being enforced, allowing fundamentalist Christian schools to teach that man coexisted with dinosaurs and fundamentalist Jewish schools to barely provide secular education at all. Although religious organizations receive tax-exempt status in lieu of government funding—to maintain the separation of church and state—the government still seeks to divert funding to churches anyway, through grants for repairs and school voucher programs. Christian fundamentalists disguise their religious agenda as education, influencing local governments and school boards to teach intelligent design as science and mandate bible courses in public schools. State and federal government policies toward women’s reproductive rights and health care are increasingly influenced by a fundamentalist Christian religious approach, resulting in a sustained assault on Roe v. Wade. Through a well-documented plan by Christian supremacists, Project Blitz is a coordinated effort to overwhelm state and federal legislatures with bills promoting their religious agenda, such as anti-LGBTQ laws and requiring “In God We Trust” signs in all public schools. In order to consolidate their already-strong sway over government, Christian fundamentalists seek to repeal the Johnson Amendment that prevents non-profits including churches from endorsing political candidates; without it, unlimited dark money would pour into campaigns through churches and turn houses of worship into political tools. 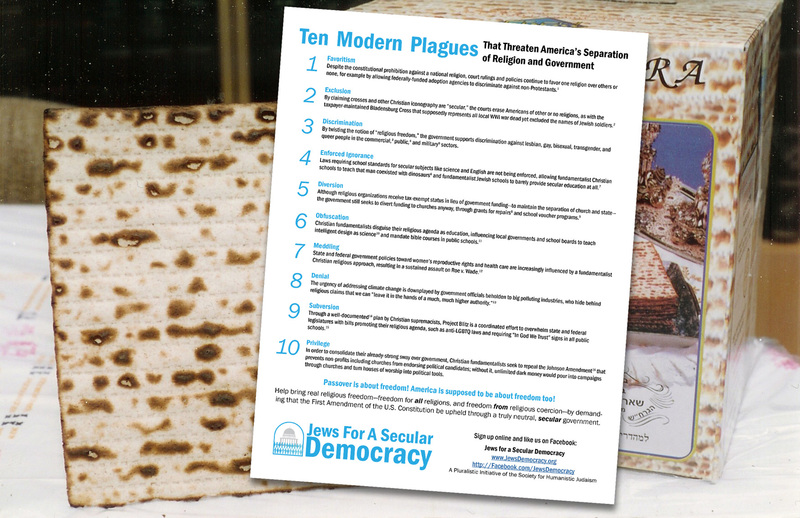 Passover is about freedom! America is supposed to be about freedom too! Help bring real religious freedom—freedom for all religions, and freedom from religious coercion—by demanding that the First Amendment of the U.S. Constitution be upheld through a truly neutral, secular government. Why Do Religious Fundamentalists Believe That Their Religious Culture and the Political State Are One and the Same? Paul Golin is team leader of Jews for a Secular Democracy and executive director of the Society for Humanistic Judaism. For nearly two decades, Paul has helped Jewish organizations and movements better understand the key trends affecting North American Jewry, including intermarriage, engagement, disaffiliation, and inclusion. Paul’s writing has appeared in the Forward, the New York Jewish Week, Tablet, and elsewhere. He co-authored the books: "20 Things for Grandparents of Interfaith Grandchildren To Do (And Not Do) To Nurture Jewish Identity In Their Grandchildren" (2007) and "How To Raise Jewish Children…Even When You’re Not Jewish Yourself" (2010). Paul previously served as associate executive director of Big Tent Judaism/Jewish Outreach Institute where he helped pioneer and refine effective engagement techniques. Paul is the white Ashkenazi half of a “Jewpanese” (Jewish/Japanese) Jewish multiracial household and he maintains the Jewpanese page on Facebook. Support this uniquely Jewish effort to keep religion out of government. Jews for a Secular Democracy is a pluralistic initiative of the Society for Humanistic Judaism.